Stana, I absolutely adore your postcards and website. You are a beautiful gift to the world. I absolutely love your notion of getting in touch with our feminine sides. It's always better than being mere guys swilling beer and watching football. I especially enjoy the half-time shows! Great cartoon that says a lot! Stana, I've read through about a month of your blog, and before I go any further I just have to tell you I think you might be my new hero!!! <3 Thank you!!! 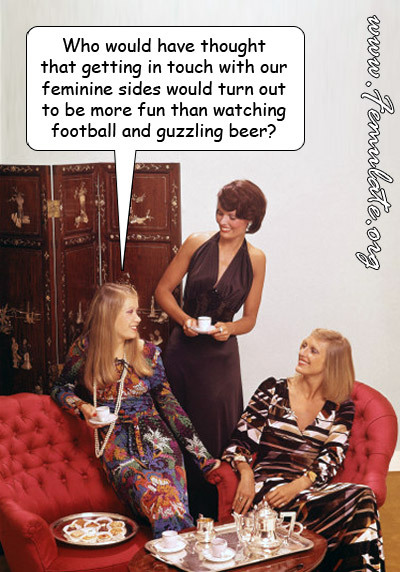 It's great to express femininity, I would swap the beer for some nice gin. Less carbs, easier on the waistline. Got to keep that feminine figure.